For all that humans might celebrate accomplishments made relating to artificial intelligence — and it’s important to remember that it was people who built these systems — we’re only too quick to write off machine minds as some lesser branch of thought. After beating Kasparov, some critics of Deep Blue noted that it ‘just’ used brute force to pick up the win. Similar efforts in fault-finding have plagued this type of technology for decades, with the phenomenon coming to be known as the AI effect. A: No, if you insist that thinking can only take place inside the human cranium. But yes, if you believe that making difficult judgments, the kind usually left to experts, choosing among plausible alternatives, and acting on those choices, is thinking. That’s what artificial intelligences do right now. Along with most people in AI, I consider what artificial intelligences do as a form of thinking, though I agree that these programs don’t think just like human beings do, for the most part. I’m not sure that’s even desirable. The divide between ‘real’ thinking, and whatever the alternative is, can only serve to downplay the results of research into artificial intelligence. Every time a machine can fulfill our expectations of thought, we change the parameters — and, even then, our superiority isn’t guaranteed. In 2003, American computer scientists decided to create a game that computers would find difficult. The result was Arimaa, a contest that uses all the same elements of a standard Chess set, but is specifically designed such that the brute force tactics used to beat Kasparov don’t offer an advantage. 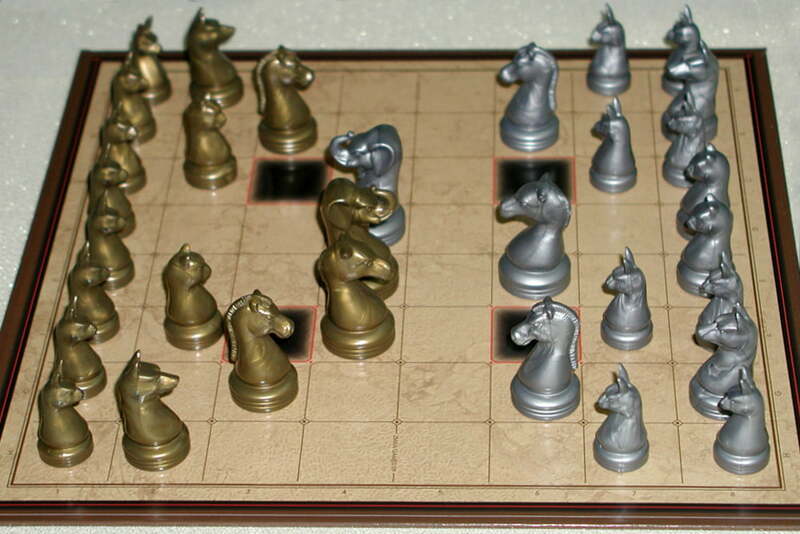 Arimaa sets itself apart from Chess in a variety of ways; players lay out their pieces in the same two rows but can arrange them however they wish, pieces are captured via a push-pull system based on manipulating their opponent into trap squares, and the game is won by reaching your opponent’s side of the board with one of your weakest units. All of these mechanics were designed with the intent of making the game difficult for computers. Compared to the 400 opening moves in Chess, and the 32,490 in Go, there are 64,864,800 possible configurations of the board available to each player before they make a single play. To further complicate matters, the pieces inhabit a hierarchy where each individual unit — an elephant, a camel, two horses, two dogs, two cats and eight rabbits — can only push or pull a weaker unit. The added potential for different outcomes means that computers are unable to rely on brute force. Its creator put up a $10,000 reward in 2004 for any computer program running on off-the-shelf hardware that could defeat the game’s three best human players. For the first several years of competition, computer players could only pick up the occasional game when the human offered up a handicap. Then, in 2015, David Wu’s three-time computer world champion program Sharp managed to pick up seven wins from nine games played and comfortably took home the prize fund. With the right (human) minds working on the project, it seems that there’s no game that computers can’t beat people at — ranging from 2,000-year-old tests of strategic insight to fifteen-year-old challenges created for this very purpose. It seems likely that artificial intelligence will be implemented into more and more aspects of our everyday life in years to come. As that process takes place, we’ll hopefully see less of a tendency to downplay these advances as parlor tricks. Computers are only going to improve as competitors, so humans need to be ready to take losses with grace.